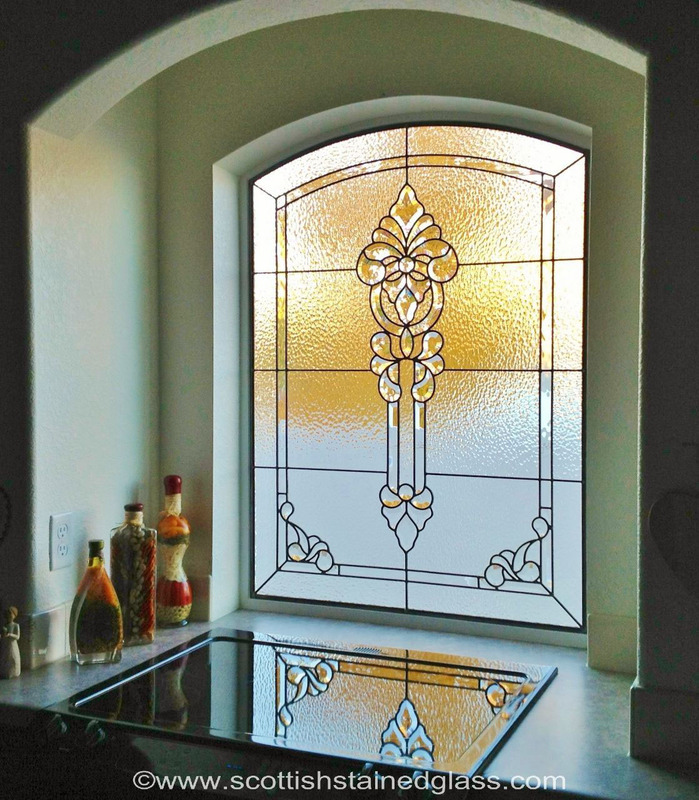 We all know that the best parties always end up in the kitchen and, similarly, some of our best stained glass ideas have ended up there as well. 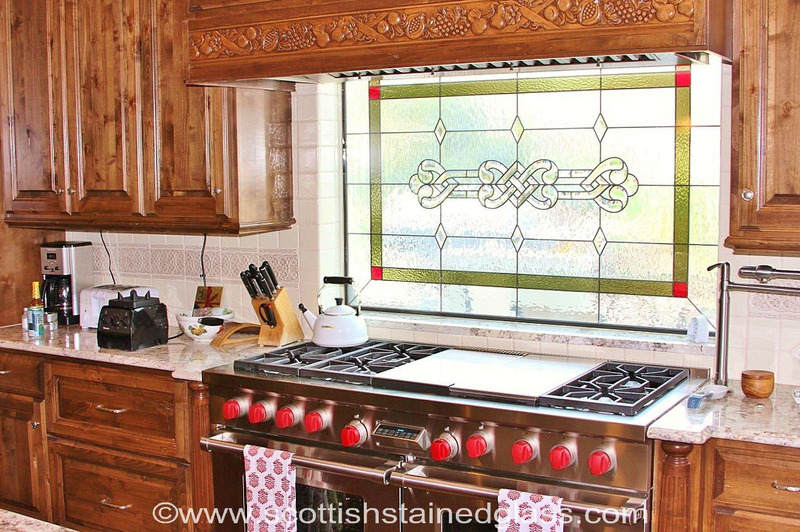 Kitchens offer a lot of opportunities to incorporate stained and leaded glass elements. 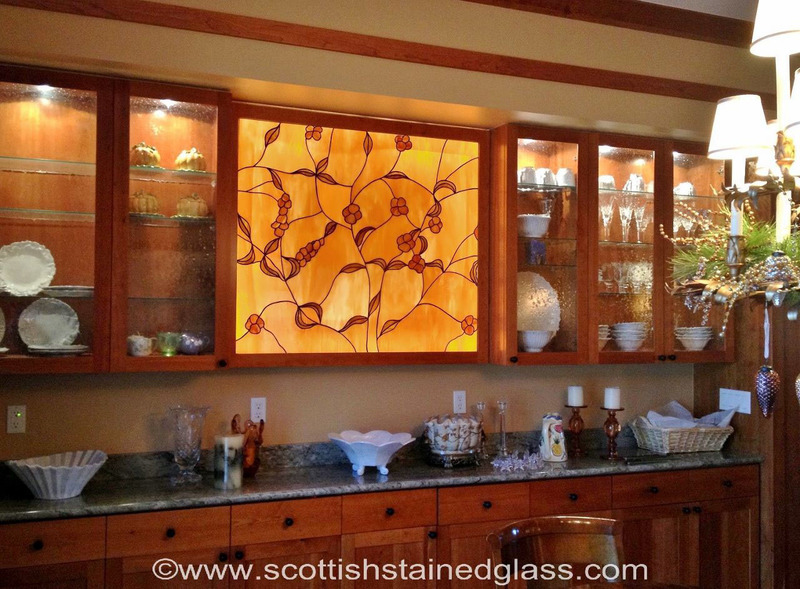 Cabinet doors are very popular places to apply stained glass. You can use all clear glass if you want to treat the cabinet as a display case, or you can use colors to block the view into your cabinet while displaying a unique piece of art and enhancing the décor of your kitchen. Incorporating beveled glass into your cabinets will give an elegant look to your kitchen, too. 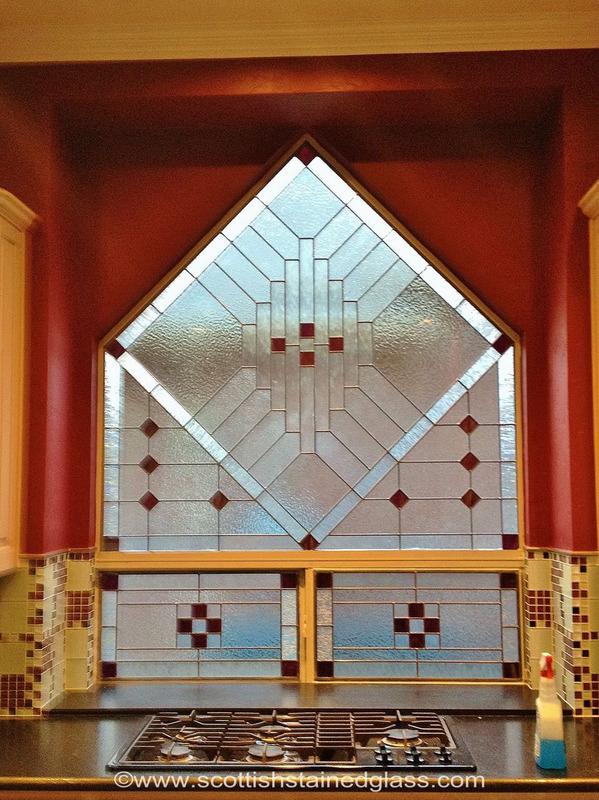 We have also installed stained glass in pantry doors and in the doors that lead to a wine room. Designs which portray grapes and leaves or even a scene from a Tuscany vineyard immediately enhance the space. It is a clever way to wow your visitors. Many kitchen windows face the side of your neighbor’s house, whether it’s their siding or a view of a window leading directly into their home, as well as your own. This view is not always the most attractive or desirable. Additionally, it can give some homeowners a reason to be concerned about their privacy. 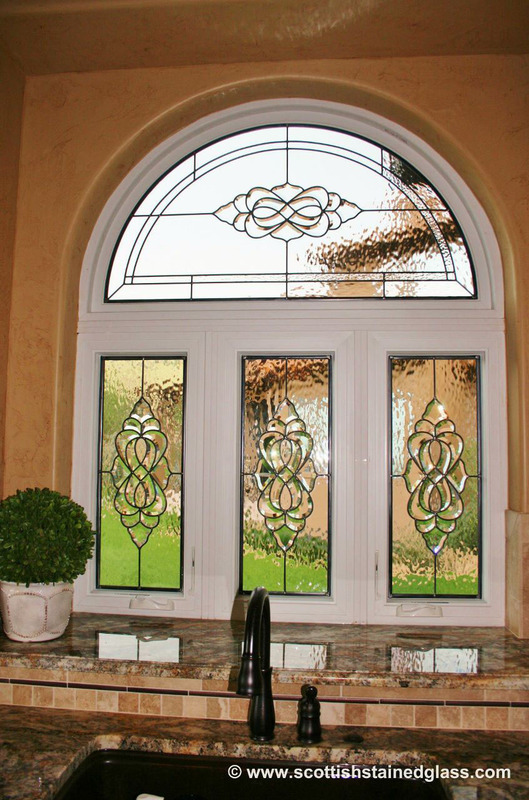 By utilizing stained and leaded glass, your eyes will be drawn from the ugly view while simultaneously preventing views into your home from outsiders. 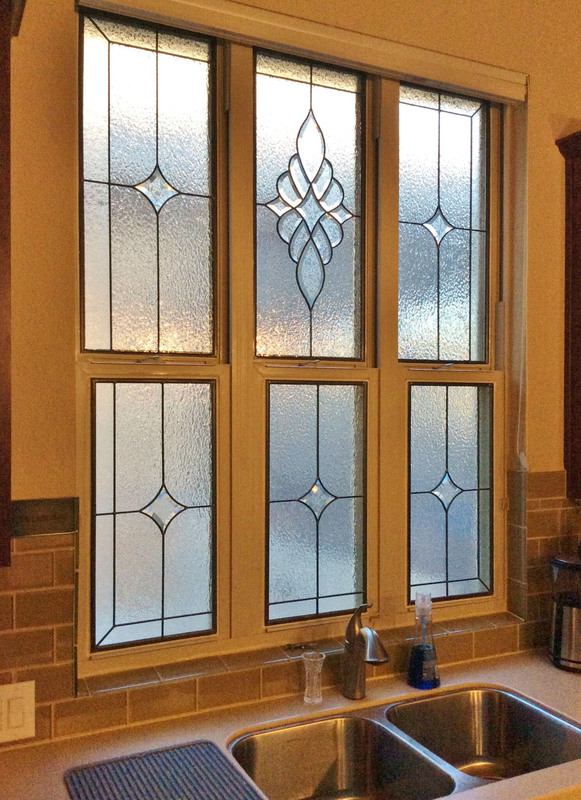 Another place that we often find which needs stained glass are transom windows that are in kitchens. 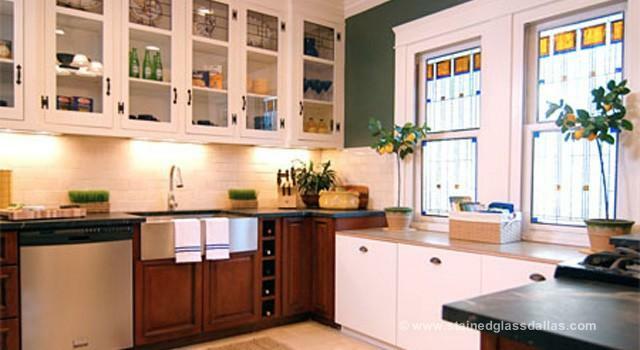 Your kitchen windows may be designed with smaller transom windows that rest above the main glass panels. Typically, the main panels below will have some sort of window treatment added. However, the smaller window above will be left open in order to allow light to come in. This is an ideal location to add decorative leaded glass. It will still allow the light in and will enhance the interior aesthetics of the whole room because of its beauty and ability to catch and disperse the light in beautiful patterns throughout the space. Once you have had a chance to view our picture gallery for kitchen window inspiration, please give us a call or send us an email. We will gladly provide you with advice and answer any questions you may have. We will also visit you personally for a free design consultation.